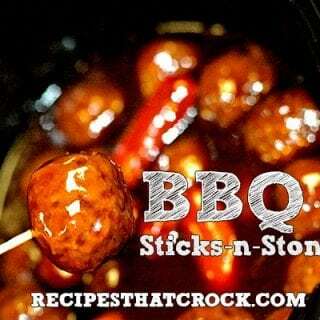 BBQ Sticks and Stones - Recipes That Crock! Are you looking for a fun twist to the traditional meatballs for your next party? 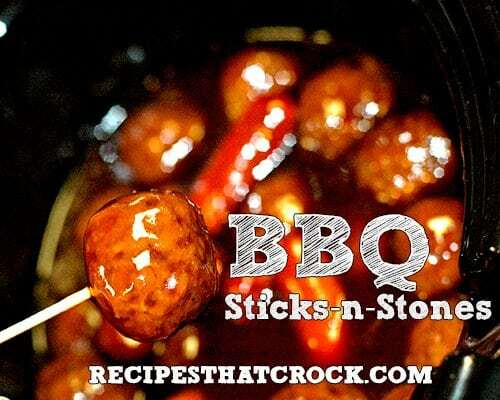 These BBQ Sticks and Stones are the perfect way to dish up something new but familiar to your guests… and they couldn’t be easier. The idea for this tasty treat came from two sources. First, I found the idea to make meatballs and weenies together (why didn’t I think of that earlier?!?) in Slow Cooking All Year ‘Round. There was a great recipe for “Sticks and Stones” in there that I will try some day soon, but I wanted to try a sauce recommended to me by a reader. My go to sauce is grape jelly and chili sauce… mmmm! I use it on my Easy Party Meatballs all the time. However, a reader told me to try BBQ Sauce instead of the chili sauce. And, well, I rarely turn down a chance to use some Sweet Baby Ray’s… and ya know what? It was sooo good! Can’t wait for your slow cooker to heat these through? Heat meatballs and sauce in the microwave in 6 minute increments while stirring in between until they are heated through. Then combine with the weenies and crock on! I love to whip up a batch of these with one of my other meatball recipes and a dip and throw into a 3-Pot Buffet Slow Cooker before a party. Sticks and Stones inspired by Gooseberry Patch's Slow Cooking All Year 'Round. BBQ Meatballs and Weenies!